The Memphis Grizzlies are running an ostensibly fun promotion that received a write-up in yesterday's Wall Street Journal: instead of cash or a car, the lucky Grizzlies fan randomly selected to take a shot from half-court will get—quote—"a lifetime supply of Tater Tots" from Sonic should the shot happen to go in. What do you picture when you read "lifetime supply"? A freezer forever being replenished with frozen Tater Tots? A card that allows you Tater Tots whenever you want them? A room literally overflowing with Tater Tots? I am picturing all of those things, and more—dump trucks full of garbage bags full of Tater Tots. A Tater Tot house. An army of Tater Tot soliders saluting a Tater Tot flag. You hit a half-court shot. Are you entitled to anything less? Jason Potter, the Grizzlies' director of promotions and event presentation, said the winner would receive the equivalent of one coupon per week for a medium order of Tater Tots. Does that sound like a "lifetime supply" to you? You can eat a medium-sized portion of Tater Tots once a week? Doesn't that just make you want more Tater Tots? Really, the embarrassment of rolling up to Sonic once a week with a coupon for a medium Tater Tots would have to outweigh many people's desire for the Tater Tots. Per the Wall Street Journal's research, a medium Tater Tots is a $1.69 value, meaning that a year's worth of medium Tater Tots coupons is worth about $88, redeemable only in Sonic Tater Tots. Giveaways by other NBA teams include: lump sums of up to $77,777, big screen HD TVs, and cars. 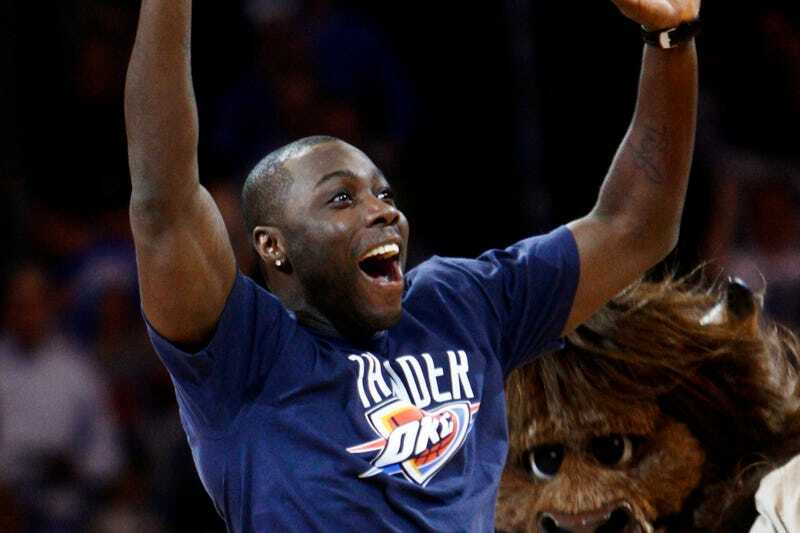 Oklahoma City gives you $100 just for hitting the backboard—the guy in the picture above won the full $20,000 when he hit the half-court shot at a Thunder game in 2010. If you get picked to take the half court shot in Memphis tonight, miss on purpose. You might hit a Sonic executive.